We're less than a week away from the official unveiling of the Lamborghini Urus and the company is promoting the event by releasing a new video which highlights the crossover's design. 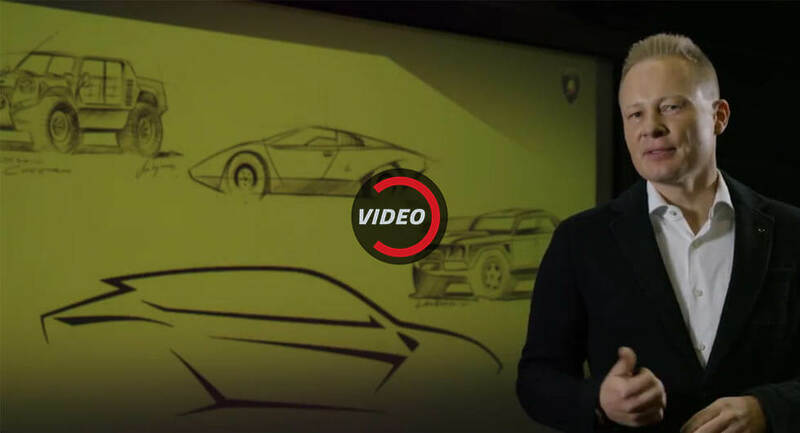 Starring the Head of Design at Centro Stile Lamborghini, Mitja Borkert, the clip explains how Lamborghini went about adapting its aggressive styling language to fit a large crossover. As Borkert notes, the company took a lot of inspiration from the Countach and LM002. On the Countach side, designers worked to incorporate the car's low profile and angle of the side windows into the Urus. The crossover also features diagonal lines inspired by the iconic super car. Since the LM002 was the company's first crossover, it comes as little surprise that it helped to shape its second model. In particular, Borkert says the LM002 helped to influence the Urus' front fender vents and wheel arches. Lamborghini went on to say the Urus has outstanding proportions and adopts the "two-thirds body, one-third window ratio" of their sports cars. The company also said the crossover has domed hood, dynamic character lines, and numerous details inspired by the Italian flag. Despite the lengthy teaser campaign, we've already seen the interior and exterior. Reports have also suggested the Urus' twin-turbo 4.0-liter V8 engine will produce approximately 650 hp (484 kW) and 627 lb-ft (849 Nm) of torque. This should enable the crossover to accelerate from 0-62 mph (0-100 km/h) in less than 3.7 seconds and hit a top speed in excess of 188 mph (302 km/h).